The start to the 2018 football season has officially begun and we couldn’t be more excited. With the regular season in full gear, people all throughout Kansas City will be spending their Sundays, Monday nights, and Thursday nights rooting for the Kansas City Chiefs (or non-Chiefs team). For pet owning football fans, it’s important to consider how this exciting time of year affects your furry family members. 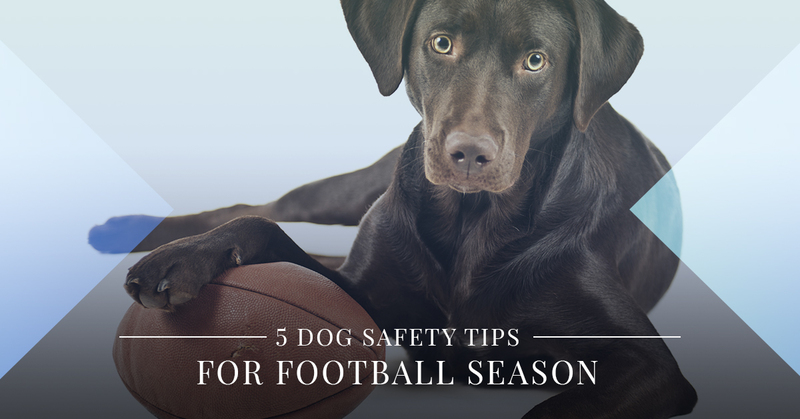 Today, let’s look at five pet safety tips to consider during football season that can help keep your dogs safe, healthy, and happy. If you need someone to care for your pup while you’re watching the game, call Eagle Animal Hospital & Pet Resort to learn more about our doggy daycare in Kansas City, proudly serving Northland, Riverside, and the greater Kansas City area. Football Sundays usually include all best (and not-so-healthy) foods, finger foods, and snacks we all love. Everything from pizza to burgers to chips, dips, and sweets can make a football game that much more enjoyable. These foods, however, can be dangerous to your dog if they consume them. You see, dogs don’t process greasy, fried, sodium-packed foods very well; their bodies simply weren’t made to do so. And while many dog parents steer clear of deliberately feeding their pups these and other hazardous foods, dogs are sneaky creatures and will follow their noses right to where the food is sitting out on countertops and dining tables. While you’re cheering for your team, your dog may be sneaking a taste of guacamole or stealing a piece of brownie from your bountiful food spread. Keep all your football foods out of paw’s reach and keep a watchful eye on your dog during the game. Whether you enjoy a sugary sweet soda during the game, an ice cold beer, or a football cocktail, these are all bad for dogs. As with greasy fried foods, dogs’ digestive systems weren’t designed to process alcohol and sweet drinks. More specifically, dogs’ kidneys aren’t meant to filter any kind of alcohol, beer or otherwise. In fact, these types of beverages can be very harmful to your dog and may even be fatal. Alcohol is toxic to dogs and while many pups love stealing sips of beer, alcohol can weaken body functions, causing respiratory issues, vomiting, diarrhea, kidney failure, comas, and in severe cases, death. Likewise, sugar and artificial sweeteners are terrible for dogs which can cause upset stomach, vomiting, diarrhea, and even toxicity. Plus, regular consumption of sugar may contribute to your dog developing diabetes. Keep adult beverages and, especially, unattended drinks away from your pup during the game. Between cheering and hollering for your team when they’re winning or losing, the volume of your television, and intermittent claps and stomps, watching a football game at home can be loud. This can cause your dog to feel anxious, nervous, and scared, so be aware of volume levels during the game. It might be best to either let your dog hang out outdoors or in another, quieter room away from the action during the game. Amid all the excitement of game day, it can be easy to lose track of time. Be sure your dog has everything they need to be healthy, safe, and comfortable before, during, and after the game. Make sure they have plenty of water and that their water bowl is replenished regularly, feed them at their normal feeding times, and ensure they get their usual exercise, playtime, and walks. If you kennel them during the game, make sure they have access to water and are kept in a quiet room to avoid causing them anxiety. For dogs who are anxious, timid, or who don’t do well with loud noises and exciting environments, consider doggy daycare. If you’ll be attending a Chiefs game in-person, you might even consider dog boarding. Doggy daycare is a beneficial pet care service that provides your dog with professional animal care and a comfortable, safe environment for a short amount of time. On the other hand, dog boarding offers the same advantages, but for a longer period of time. Call Eagle Animal Hospital & Pet Resort to learn more about dog boarding and doggy daycare in Kansas City. At our Northland animal hospital and pet resort, we offer a state-of-the-art, Fear-Free Certified doggy daycare and dog boarding facility to keep your dog happy, healthy, and comfortable. Learn more today!